The shock in our office is unreal... The possibility of Fabric, one of the world's most famous nightclubs, shutting down is a bit too much to handle. Voted 'Best Club In The World' twice in DJ Mag's Top 100 Clubs, the news of it's possible closure is bound to create outrage within the dance community. The London Evening Standard announced this morning that the police have demanded a review of the clubs license after a string of drug related deaths and arrests. Over the past 3 years, there have been 4 drug related drugs at the club including an 18 year old girl in September who bought MDMA inside the club and later died in hospital. "In a police report submitted to the committee, Pc Steven Harrington said: “It attracts clientele from all over Europe and it would seem that the immaturity or lifestyle of these patrons leads to them becoming actively involved in the taking of illegal drugs and this could account for the disproportionate and wholly unacceptable number of deaths and near death incidents at the venue.”"
The alternative to the closure could be the introduction of sniffer dogs and stricter security at the venue, a move that has been welcomed by other venues in the UK - The Warehouse Project as a prime example. Sacha Lord, The Warehouse Project director, discussed their security measures in a recent BBC Three documentary with Radio One DJ and original Digital Soundgirl - B.Traits. He explained that their security measures were increased after the death of Nick Bonnie at The Warehouse Project during the 2013/14 series, after which a further spate of drug related incidents followed. If the safety of clubbers is truly at the forefront of everybody's minds then the new security measures should be welcomed, as an alternative to forcing closure. The problem will move on to another club, sparking further closures - a move that will be massively detrimental to the dance scene in the UK. It doesn't tackle the wider issue. British charity, The Loop, recently won 'The Best Use of New Technology' Award at the 11th UK Festival Awards for their implementation of drug testing at Manchester's Parklife Festival 2014. While the British government are reluctant to implement public drug testing within venues for the fear of encouraging drug misuse, Professor Fiona Measham and the rest of the team at The Loop have sourced equipment which allows drugs that have been confiscated or placed into amnesty bins to be tested in real-time, giving promoters the opportunity to warn clubbers of any bad or unusually strong batches which may have found their way into the club. This includes so-called 'legal highs' which many clubbers assume to be safe, a statement that could not be more untrue. Further safety measures have been implemented, including on-site welfare teams who offer non-judgemental advice and assistance to clubbers. Another move welcomed by the dance community. 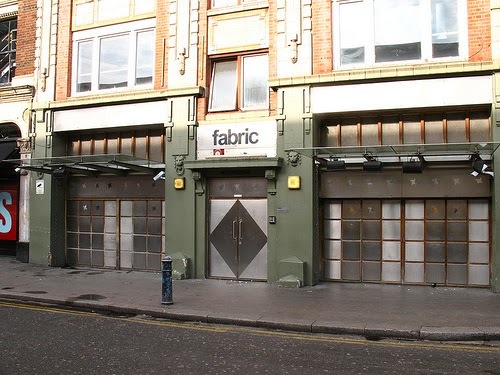 Outraged clubbers have taken to social media, using the hashtag #savefabric but at this moment in time, we can only wait and see, and hope that Fabric doesn't have the same fate as a number of other clubs in the capital city. Signatures are coming in thick & fast for this one!